There are so many mixed messages floating around regarding caffeine consumption during pregnancy. One day, the news network may highlight a study claiming it is safe. The next day, you may read about a new study linking caffeine consumption to miscarriages. So what's an expectant woman to do? Research in this area has drawn conflicting conclusions over the years. In 2008, one study found an increased risk of miscarriage when over 200 milligrams (mg) of caffeine was consumed daily, while another found no increased risk with caffeine ingestion up to 350 or 500 mg daily. Other studies have found an increased risk of stillborn births with large amounts of coffee consumption (over 4 cups per day) while pregnant. To play it safe, the March of Dimes® recommends that pregnant women and women trying to conceive limit caffeine intake to less than 200 mg per day. This recommendation stems from research published in the American Journal of Obstetrics and Gynecology in January 2008 that found women who consumed over 200 mg of caffeine per day were twice as likely to have a miscarriage as women consuming no caffeine. Caffeine acts as a stimulant and is present in many foods and beverages. Caffeine has the ability to cross the placenta and reach the baby. It may also decrease blood flow to the placenta, which has the potential to harm the developing baby. Caffeine is found in coffee, tea, colas, chocolate and some coffee- and chocolate-flavored foods and beverages. 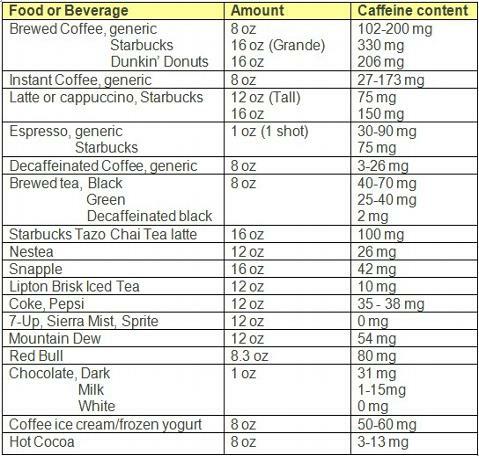 The chart below gives caffeine content for a variety of commonly consumed caffeinated foods and beverages. As you can see from the chart, there is a great deal of variation in caffeine content depending on the brand and brewing method. Generally speaking, brewed coffee contains the highest amount of caffeine per serving. Just one 16 ounce (oz) coffee from Starbuck's puts a pregnant woman over the daily limit recommended by the March of Dimes® by 130 mg! How can I limit my intake of caffeine? Sub up to one cup of green tea for your daily java and you'll save between 70 and 300 mg of caffeine. However, be cautious and limit green tea to one cup as higher doses may decrease folate absorption, important for your growing baby. Make sure to take your prenatal vitamin or additional folate as prescribed by your physician. If you drink soda, opt for 7-up, Sprite, or Sierra Mist instead of cola-beverages or Mountain Dew. If you are a chocoholic, opt for white chocolate instead of dark or milk chocolates. Savor a scoop of vanilla bean ice cream over chocolate or coffee flavors. Instead of using energy drinks for a pick me up, go for a walk outdoors, get up and do some stretches, turn on some music, or simply try to get an extra hour of sleep each night. Janice H. Dada, MPH, RD, CSSD, CDE, CHES is a registered dietitian specializing in preventative nutrition, weight management, sports nutrition, diabetes and cardiovascular disease. She teaches introductory nutrition courses at the college-level and owns SoCal Nutrition & Wellness, a private practice in Newport Beach, California. She is a contributing writer to www.superkidsnutrition.com. For more information about her practice, please visit www.socalnw.com or email Janice@socalnw.com.